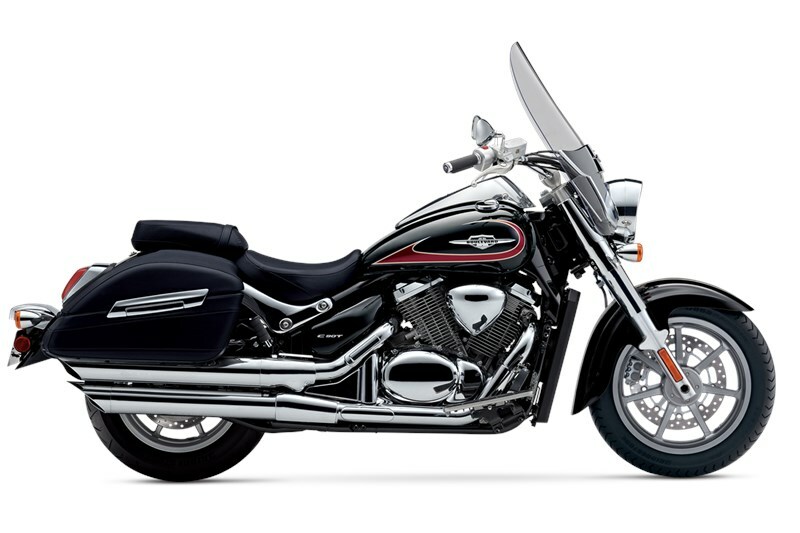 The Suzuki Boulevard C90T is powered by a 90-cubic-inch V-twin engine that delivers exceptional torque for outstanding acceleration in every gear. It also features fully integrated leather-look, rigid side cases and a comfortable passenger seat, all behind a large windscreen for remarkably comfortable cruising on the open road. With bold, classic styling, the C90T is also designed to capture attention whether you’re cruising down the boulevard or kicking back at a rest stop. The four-valve cylinder head with overhead camshafts and dual spark plugs increase combustion eﬃciency to help ensure seamless throttle response, gutsy low-to-mid range output, better fuel eﬃciency, and reduced emissions. Both rider and passenger seats are made for long-range comfort and top-notch control. They allow freedom of movement, accommodate riders of diﬀerent sizes, and are well cushioned.